India bagged a Gold and two Silver medals at the Boxing World Cup at Cologne in Germany. 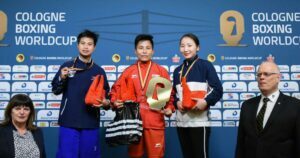 Meena Kumari Maisnam (from Manipur) claimed the Gold medal in the 54 kg category. The 2014 Asian Championships bronze medallist defeated Thailand’s Machai Bunyanut in the final. Sakshi in 57 kgs and Pwilao Basumatary in 64 kgs had to settle for Silver medals after they lost their final bouts. India finished the tournament with five medals as Pinki Rani in 51 kgs and Parveen in 60 kgs had earlier won Bronze medals.